Ravana (NTR) has conquered the human world and is at a loose end. Being a magnanimous ruler, he asks his brother demons what they want as a reward for this victory. His generals suggest a sleeping festival (excellent! ), peace and justice for all, and finally that he declare war on heaven as the gods are worthy opponents for demons, not like frail humans. In order to avert this war which Ravana will likely win, the sage Narada (ANR) starts conniving and scheming to keep Ravana from invading. Ravana is brave, intelligent, principled but very impulsive and has little self control. NTR is in his element as the larger than life Ravana. He creates a sympathetic character but one whose flaws are all too evident. The character spans broad comedy, doe eyed romance and the aggressive assurance of unchallenged leadership. Ravana is easily manipulated by Narada, Vishnu, Parvathi, his own mother and Ganesh among others. His lack of insight and self awareness brings him undone when he has the potential to rival the gods should he focus his will. So he is like lots of men we all know- asked to bring back one specific item from the shops, and coming back with either nothing or something completely random. Ravana’s mother Kaikasi (Hemalatha) is a devotee of Shiva. When her prayers are disrupted to stop her gaining Shiva’s benediction, she charges Ravana with making Shiva answer her prayer. He is a total mummy’s boy. He takes it one step further and promises to bring back Shiva’s atmalingam, his soul, for her to pray to. When he decides to beseech Shiva through rigorous penance, not even Helen can distract him. But he loses this focus and falls under an illusion that sends him off on a tangent. Ravana’s quest to win back that blessing from Shiva takes many detours thanks to Narada. Narada (ANR) is intent on maintaining the status quo. He plays on the susceptible Ravan and the change resistant gods. He puts the wind up heaven with dire predictions about what will happen should Ravana succeed. He stirs up Ravana’s impulsive and suspicious nature to manipulate him. ANR’s performance is lots of fun with a supercilious eyebrow here, a self serving whinge there, and a whole lot of economy with the truth. He sabotages Ravana’s request for a boon from Shiva, using illusion to persuade Ravana to ask for Parvathi as his reward. But the plan doesn’t play out exactly as Narada hoped, and he scrambles from drama to catastrophe and back again with only his wit and sophistry to help him navigate between the gods and demons. The gadfly tactic manoeuvres the protagonists, sets up conflict and also provides some of the more comedic moments. Shiva’s alert and active snake companion was a highlight. The snake is quite interested in the proceedings. I was picturing the person responsible for snake directing and the bag of tricks they must have employed. Occasionally the snake would have a snooze and seemed to be waiting for someone to do something entertaining. Nagabhushanam portrays Shiva in a more paternal style, taking an indulgent approach to his devotees most of the time. 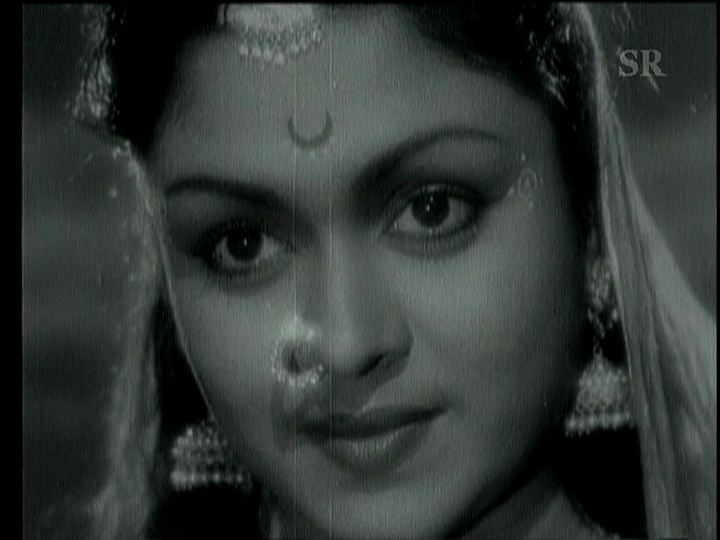 Parvathi (B Saroja Devi) is beautiful and stately and her role requires little more than that. Parvathi is used as a pawn in the game Narada is playing with Ravana, and despite her power she finds herself being carted around from pillar to post. But finally after prompting from the ever helpful sage, she uses her own power of illusion to break free. Apparently Ravana couldn’t see her inner beauty. Mandodari (Jamuna) is Mayasura’s daughter, and persuades herself to fall for Ravana. Jamuna is lovely but she looks a little too mature and knowing to be totally convincing as the young and inexperienced princess. Her handmaidens joke about how Ravana will be a bucktoothed crosseyed hunchback and then tease her when they see she has feelings. Mandodari is very privileged and enjoys the finest things in her father’s lavishly decorated aquatic themed underwater kingdom. But she has a hard time of it when she gets the husband she wants and discovers he was under the impression he had married the goddess Parvathi. Mandodari is another unwitting player in Narada’s plan to keep the three kingdoms in their proper place. 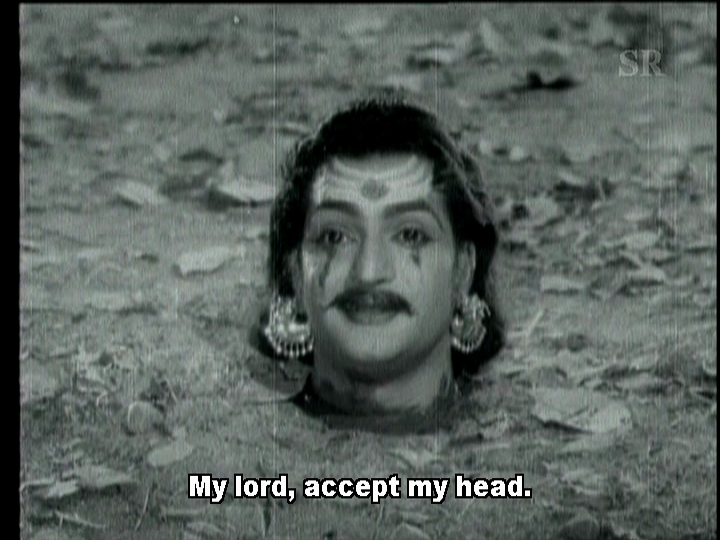 After all the trickery and deceit, Ravana offers penance in very dramatic style, cutting off his own head. It makes the acts of contrition my school priests used to dish out look pathetic. Ravana wins forgiveness but fails to triumph thanks to his inability to stay on task. Again. He neglects an instruction, disregards a warning and jeopardises the very thing he had struggled for. His flaws were his undoing and they were all things he could control or learn to manage. Luckily his failure created something very special for the human world, so the film ends on a cheery note. The animosity between would-be in-laws Ravana and Mayasura (an ebullient S.V Ranga Rao) is due to their worship of different gods – Shiva and Vishnu. There are some very pointed references to this, including Narada rebuking them for not realising that god is one and omnipotent. I wondered if this speech was in response to current day issues or purely part of the story. It seemed to be directed straight down the barrel of the camera which made me think it was at least partly commentary aimed at the audience. The songs are particularly enjoyable, even more so with the bonus of excellent dancers. The songs are directly linked to the story so expand on things or underline issues. In Mayasura’s palace Kamala Laxman performs a very elegant dance depicting Vishnu’s avatars, while Gopi Krishna dances in a more wild and entranced style in devotion to Shiva. The visual effects are simple, and the use is restrained, so they also enhance the atmosphere of a world outside of human reality. As with many of the devotional, religious and mythological films from the 50s and 60s that I’ve seen, you don’t need to know anything about the main characters as a preqrequisite to enjoy the story. Bhookailas is beautifully self-contained, and K. Shankar has structured it to make the story accessible and entertaining. Watch this for the rattling good story, the wonderful actors and the visual riches. 5 stars! Heather says: I found Bhookailas to be an interesting film as it shows Ravana from a totally different point of view. 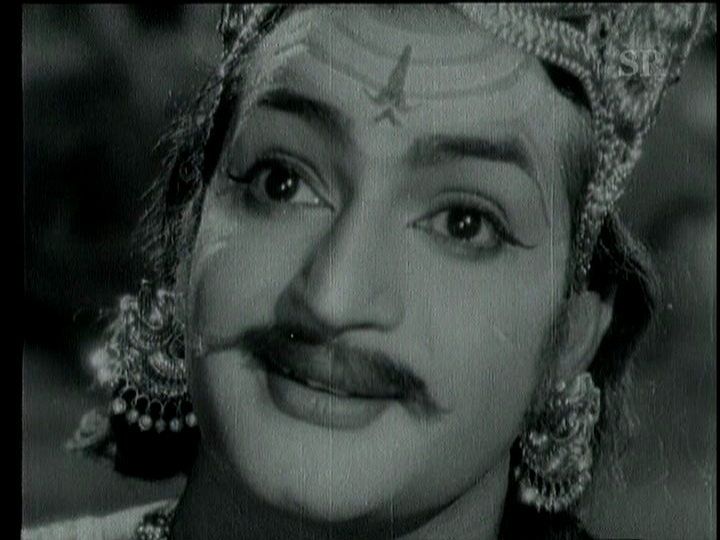 NTR’s demon king is depicted more in his ‘devoted follower of Shiva’ character rather than the more traditional ‘Ravana as the embodiment of all evil’ and for most of the film he is heroic and really quite dashing. 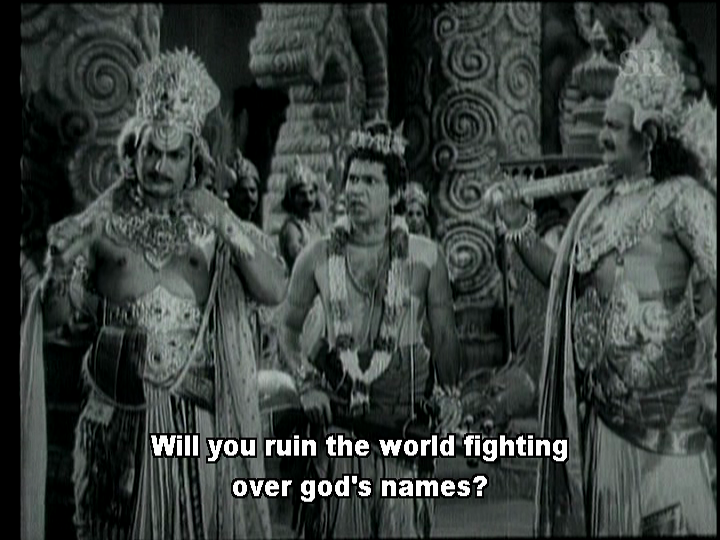 It’s quite a change as I think this is the first film I have seen where Ravana hasn’t been just the villain that everyone is supposed to hate and it does make for a fascinating story. NTR is excellent in his role and his depiction of Ravana’s all-conquering and all-powerful king is very believable. His devotion to Shiva is well shown but even better is his colossal arrogance which NTR hits just right, and when Ravana loses his temper there is a real edge which brings out his demonic nature clearly. However, Although I really liked NTR here, the standout performance for me was ANR. He is brilliant in his depiction of the sage Narada, and I think that this is probably the best characterisation of the trouble making sage I have seen. Narada’s frequent nods, winks and knowing looks are very well done, and he excels in causing trouble for trouble’s sake. ANR hits the character perfectly and his mannerisms and facial expressions make his scenes very enjoyable to watch. The interactions between Narada and Ravana are also very well written, and both actors work very well together to bring their characters to life. As Temple has mentioned, there is very little scope for any of the female roles here, and Hemalatha as Kaikasi probably has the role with the most substance. I enjoyed her performance and her exasperation at her impetuous son was excellently done. I wasn’t very impressed with Jamuna’s Mandodari and all her simpering, but I did love the underwater palace where she lived. Seeing Helen pop up in a song was a lovely surprise, and I was suitably impressed that Ravana was able to ignore her wonderful dancing as he meditated. Great music, fantastic performances and a thoroughly entertaining story make Bhookailas very well worth watching and I thoroughly recommend it. 4 stars. This entry was posted in Tollywood and tagged Akkineni Nageshwara Rao, ANR, B. Saroja Devi, Bhookailas, Classics, Gopi Krishna, Helen, Jamuna, K. Shankar, Kamala Laxman, N.T. Rama Rao, Nagabhushanam, NTR, S.V. 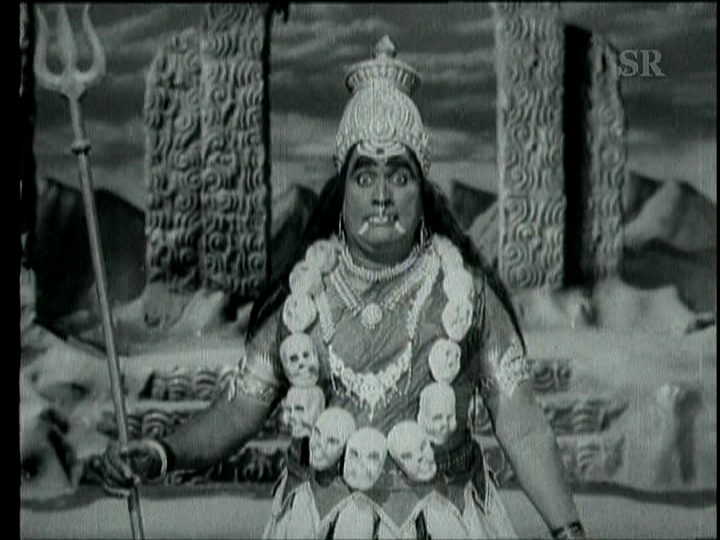 Ranga Rao, Telugu, Tollywood. Bookmark the permalink. Well, it surely looks entertaining! The illusion is created by Vishnu, not Narada. I mean the one where he asks for Parvathi. This is why Parvathi curses Vishnu that he will also suffer from similar separation from the spouse. In his case, he(as Rama) is separated from Sita. I see that Heather has commented on the different depiction of Ravana. This isn’t really new since there is a long history of the same in the South of India. The reason is largely political. The Ramayana has a tendency to imply that all areas in the south of India are populated by Demons and animals. Also the demons or Asuras are often depicted as dark skinned and mustachioed with large eyes (very similar to traditional south Indian looks) . Also Saivam or worship of Shiva is very common in the South. All this has led to many SI poets and writers self identifying with the Asuras and so they offer very sympathetic portrayals of Ravana and the Demons. This seems to have been a tradition that started with the Kamba Ramayanam, a famous Tamil retelling of the Ramayana written in the 12th century AD. 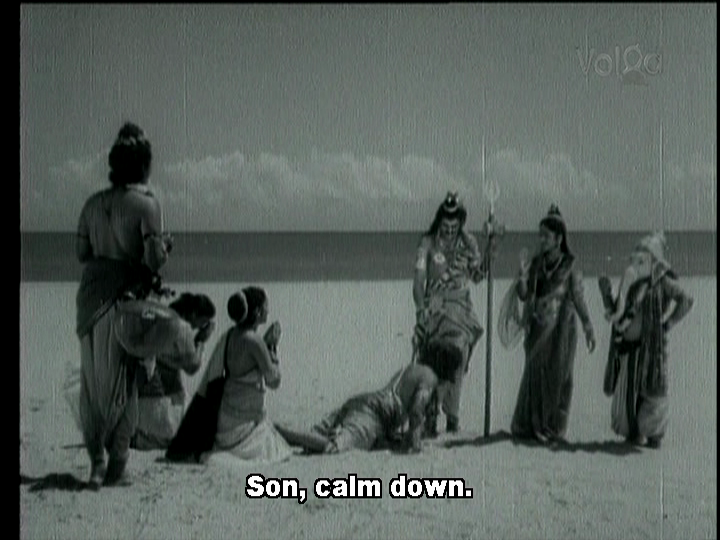 On a different note, since you guys seem to like mythological movies, I would like to recommend Kandan Karunai. It is a beautiful film, with lovely costumes and great music. Thanks for your explanation 🙂 This was the first film I’d seen where Ravana was depicted as something other than purely evil, although I’ve read stories where he was more sympathetically portrayed and seen a few school plays on my visits to Tamil Nadu where the demons were mischievous rather than bad.It’s interesting since as you say the North of India does seem to look down on the South, which seems in many ways similar to the attitude of the South of England to the traditionally poorer and more industrialised North, but without any particular reason. I totally agree with you and Temple about Kandan Karunai – it’s a lovely film. Any more recommendations? @Divya: Stop spouting rubbish. Dont include the whole of south India in your analysis. I would agree that what you say is indeed true in Tamil Nadu. Your twisted race theories find no purchase in Andhra. 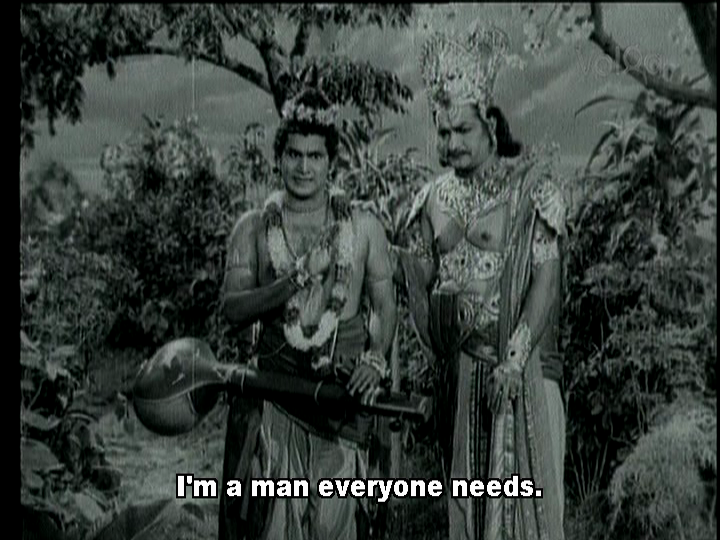 But atleast in Andhra, Ravana is what he is – a demon. 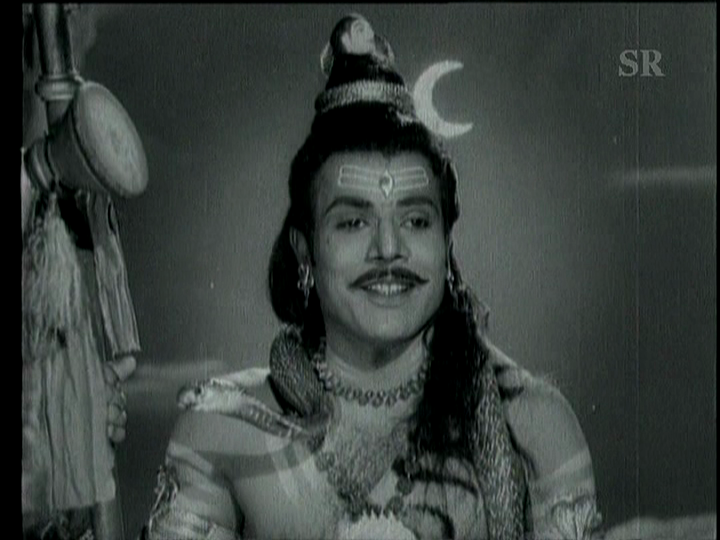 This tendency to portray the villains in slightly positive manner is a trait of the Telugu film Industry. It isnt restricted just to Ravana mind you. NTR depicted Duryodhana and Karna in a similar manner in DVS Karna. He tried doing the same with Keechaka in the film Virata Parvam. And it miserably flopped in the box office. I put some of NTR’s positive portrayal of Karna down to his star status that precluded him from playing a truly negative type. He was a hero (as an actor) so there had to be a good aspect to the character. 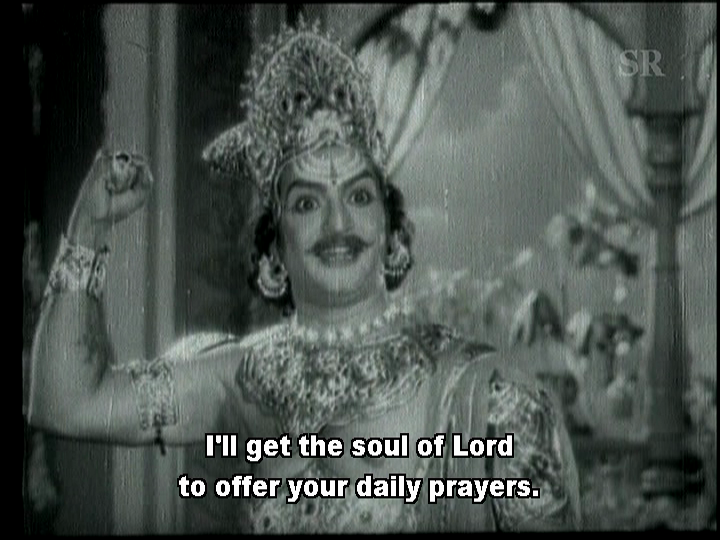 What is your favourite vintage Telugu mythological or devotional film? Thanks a lot for this review. I have been waiting for it for a long time. Super ! Well , I was attacking the ideology. The same ideology has been used by the DMK to depict Tamil Brahmins as traitors. (akin to Rosenberg’s views on Jews in Nazi Germany). We know what Rosenberg’s ideology led to. I dont think I can say I have a favourite now. Because I too – like you and Heather – am on this journey of discovering good Telugu films from before the 80’s. Maybe once the journey is completed and I have watched and rewatched the best ones, I can come to a conclusion. 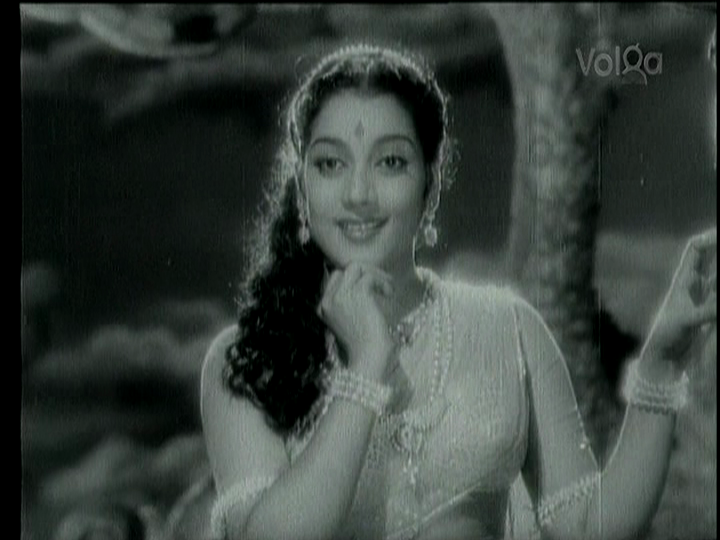 But ‘Sampoorna Ramayanam’ starring Sobhan Babu captivated my imagination as a kid. I think you hit the nail on its head when you said NTR’s star status has something to do with this portrayal of Karna, Duryodhana, Ravana etc. NTR was in a mad rush to play all the characters of the Mahabharata. And I think he did end up playing all the important ones. As luck would have it, I found a subtitled DVD (fingers crossed it really is) of Sampoorna Ramayanam on Bhavani DVD so I’ve added it to my next order. 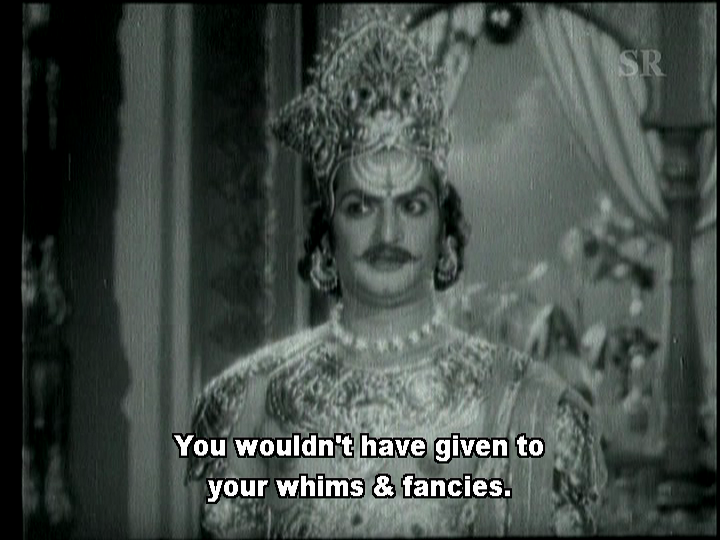 It is great to see so many of the older Telugu films being added on Youtube, even if subtitles are a bit hit and miss. I prefer to have subs for the religious and mythological films as there tend to be long stretches of dialogue that are important to the plot and hard to guess at if you don’t already know the story or understand the language. Legal full length Telugu movies are being uploaded at a rapid pace onto Youtube. Shemaroo, Volga, Suresh Productions, RajShriTelugu , TeluguOne etc. have upload many movies. Sadly, Youtube search is not so advanced to allow me to search all of them. I click the movies link in a full length movie to give me only movie results. But beyond that I am not able to sort these movies by popularity etc. And Sampoorna Ramayanam is available on Youtube. Sadly, no subtitles though. It has just been uploaded yesterday ! Wow. Yay for Gopi’s dance in Bhookailas. There are only a few good ‘tandava’ style dancing in movies. 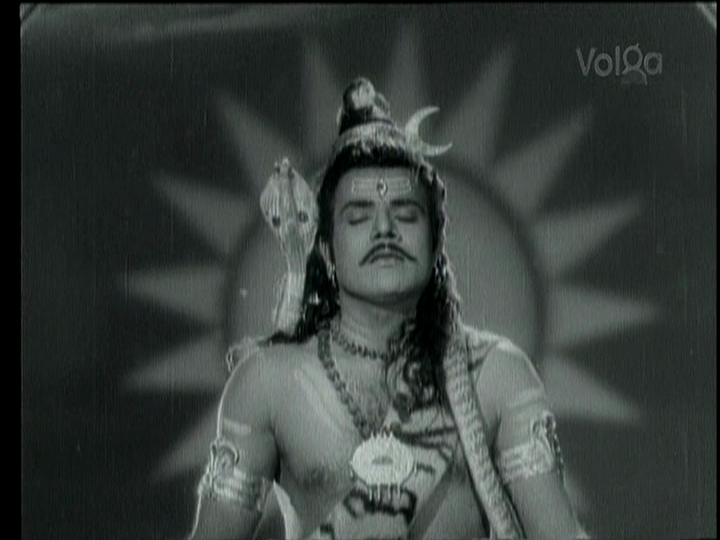 I always get confused with NTR’s Ravana between Bhookailas and Sri Seetha Rama Kalyanam (1961). 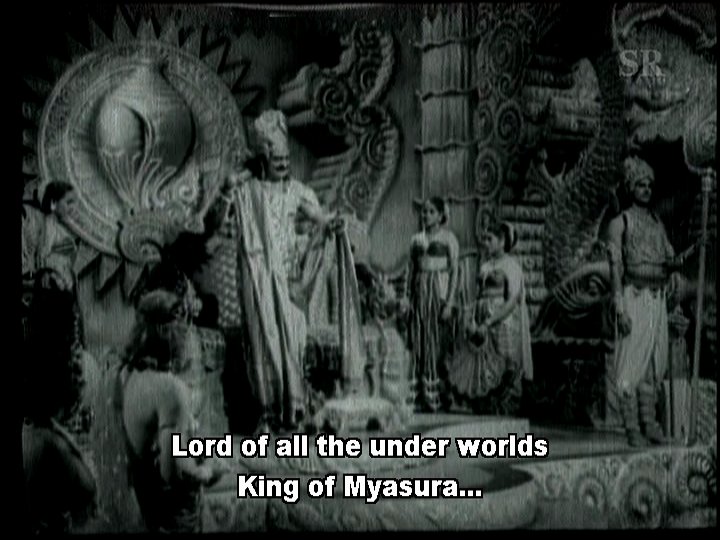 Despite the title being about Rama and Seetha, most of the story moves around NTR’s Ravana there. If you watch them together, its like one is extension of another. H Violet. I have a copy of Sri Seetha Rama Kalyanam floating around but haven’t watched it yet. I’m also a fan of the tandava, and they are comparatively rare in films. Minai Minai has an excellent post on tandavs at her blog, if you haven’t already seen it. Violet, are you Telugu ? 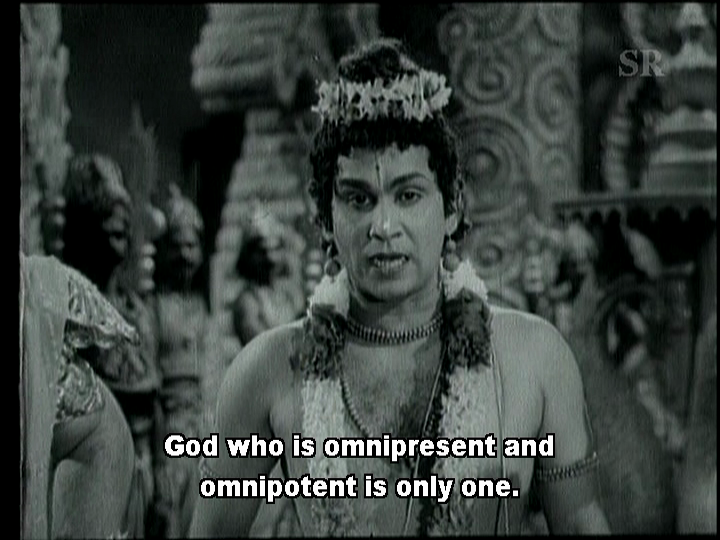 Re: Narada rebuking Ravana and Mayasura for not realizing God is one and omnipotent. But internal quarrels between Shiva and Vishnu worshippers became frequent around about 6th century AD. Many more people continued to emphasize the oneness of God so that by the time this movie was made, there was no Intra-Hindu conflict. So I think there was no pressing political or social reason during the 50’s to reassert this point. It was just a message for the people of a young nation. This song emphasizes the same point. It was composed in the 14th century by http://en.wikipedia.org/wiki/Annamacharya.